As much as we love the PR2, it's not a robot that anyone would likely describe as "quick." Not that it's trying to be quick or anything, but it does have a tendency towards being absurdly slow, generally because it's doing very complicated things. However, for a robot like the PR2 to be useful in any sort of versatile industrial setting (which is slowly but surely becoming a huge market for robotics), speed, efficiency, and reliability is very important. 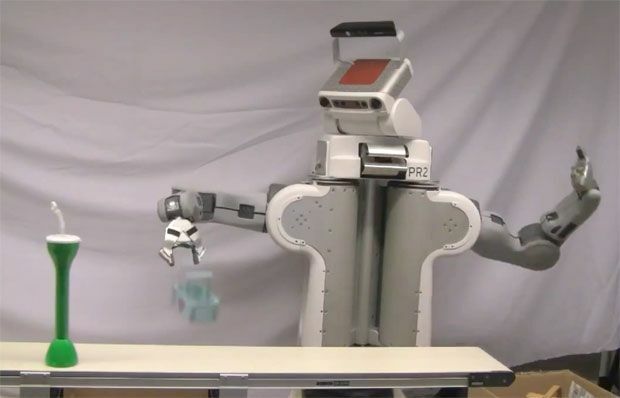 Some talented roboticists have been working away at this problem, and they've managed to get a PR2 to pick and place (or at least, pick and drop) objects at a rate of one every seven seconds from a conveyor belt moving at over a foot per second. This is quite possibly the fastest I have ever seen a PR2 move.